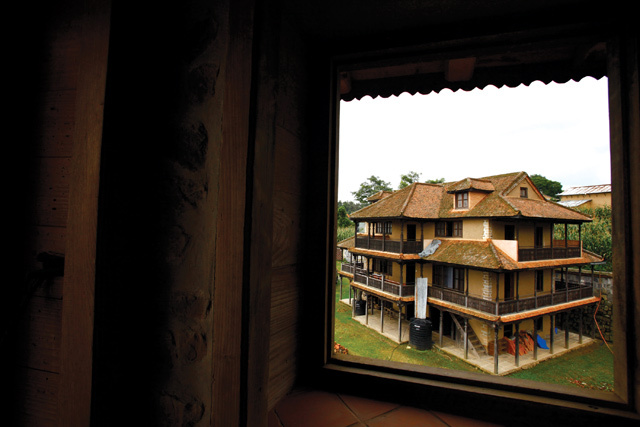 The resort in Fulbari, Kavre built using traditional materials and techniques did not sustain any structural damage in the earthquake last year. When the Malla dynasty ruled the Valley’s kingdoms, rivalry between rulers translated into magnificent monuments, bahals and city squares in the three main towns. Over time, this extraordinary architectural heritage has been confined to the historic cores of the towns. These centuries-old mud-brick structures were hardest-hit by the earthquake last year, sending the incorrect message that traditional architecture is weak and prone to seismic damage. One-and-a-half years after the earthquake, it is clear that most ruined homes are being rebuilt using concrete beams, with few choosing traditional facades and even fewer opting for traditional materials. In Harisiddhi, Bungamati and Sankhu, while the temples are yet to be reconstructed, new homes are being built with concrete and have started dominating skylines that used to feature tile roofs. Conservation architects are appalled, not just because this spoils the traditional look of the towns, but also if the right materials and techniques are used, older designs would be more seismic-resistant. Bhaktapur’s historic core suffered some of the worst damage. A few blocks off from Dattatreya Temple, in an alleyway in Inacho, old houses destroyed by the earthquake have been ravaged by two monsoons and are neglected. Just opposite, Namuna Ghar stands tall and unscathed. The 150-year-old house was renovated in the early 2000s using mud, brick and timber, but did not suffer even a hairline crack during the earthquake, and just lost some jhingati tiles from its roof. Puri’s other projects — including the Toni Hagen House in Gachhen and the ambitious Namuna Gaun in Sanga where three houses (one each of stone, brick, and mud mortar) line a ridge — all survived the earthquake. In Patan, Devendra Shrestha says restoring his family home in the traditional style was the best decision his family ever made. The Malla-era Newa Chhen, also known as Shrestha House, was renovated and opened as a tourist accommodation in 2006. While the nearby residential buildings are supported by wooden frames after the earthquake, the 350-year-old house sustained only minor damage. 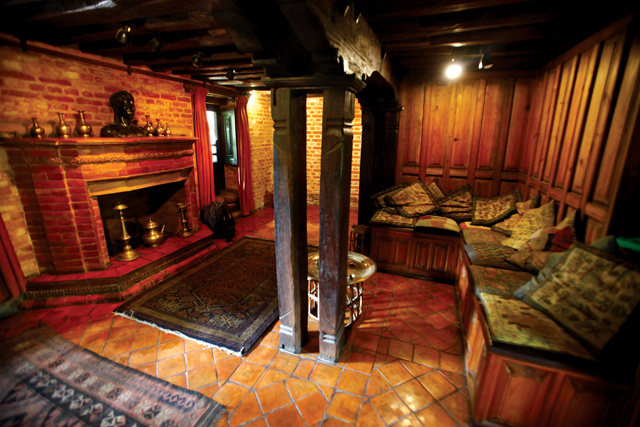 “No new materials were added when it was restored,” says Shrestha, “and by the looks of it, it was the right decision.” What makes traditional architecture relatively earthquake-resistant is that from the floor to the attic, each element is bound together. The use of timber, mud and traditional chuku joints and wooden beams makes the house flexible during quake shaking. The maximum wall thickness on the ground floor, double framing of windows, wall plate weightage, roof system, as well as use of bigger bricks like ma apa — these make traditional buildings resistant to earthquakes. Adding traditional silhouettes and textures of the Valley’s Newari architecture into designs while rebuilding would not only add to the aesthetics of the city but also help conserve Kathmandu’s unique architectural heritage. The neighbourhoods would be elegant, affordable, and suited to the climate because of the use of mud mortar and brick. With salvageable materials, building a house the old way would cost Rs 3 to 4 million in the Valley. Rabindra Puri’s resort in Fulbari of Kavre using only mud, brick and timber withstood the earthquake. “Even if something does happen during the earthquake, the human casualties will be much fewer,” says Puri. Old architecture does not mean an outdated lifestyle, as interiors can be modern. Examples of this are Newa Chhen in Patan and Namuna Ghar in Bhaktapur, which blend old and new in perfect harmony. Old does not mean weak, as traditional architecture is flexible and can withstand shaking better. 1. Wall thickness: Its thickness is maximum on the ground floor and decreases on the higher floors, reducing shear failure. 2. Mud mortar: Mud may be a weak binding element but it helps absorb shock waves and cushions the walls, preventing a total collapse of the building. 3. Timber: Traditional houses have beams, joists, lintels, beautifully carved doors, windows and pillars. Timber ties the brick walls, and bend with shock waves, preventing the distortion or displacement of walls. 4. House plan: Traditional houses are generally rectangular or square, which gives them better stability. 5. Height: Traditional buildings are never more than four stories tall. Keeping this dimension makes for safer and more aesthetic towns. How old does a building have to be, to be considered an architectural heritage? Which style is the original? These questions are at the centre of the debate about post-earthquake reconstruction of monuments and temples that were restored in the Mogul style after the 1934 earthquake and destroyed again last year. For example, should the iconic Balgopaleswor Temple in the middle of Rani Pokhari be rebuilt in the stucco Rana style, or as a Newari tiered temple? The Kathmandu Metropolitan City (KMC) decided to reconstruct it as it was before April 2015, but using reinforced concrete columns to increase the structure strength. There was an uproar on social media, protests were held, and the KMC has now been forced to backtrack on its decision. The Department of Archaeology directed the KMC to demolish the cement pillars, and the project has been halted for the moment. Says urban planner PS Joshi: “Heritage is not only about art and artefacts, it is about the knowledge of our ancestors that is on the verge of being forgotten, and the link between tangible and intangible heritage.” Joshi is an advocate of traditional materials as well as traditional techniques being used wherever or whenever newer methods have to be employed. After the 1934 earthquake, many of the temples lost their original form when they were rebuilt. The Bhai Dega temple in Patan was a three-tiered pagoda-style structure dedicated to Lord Shiva. It was rebuilt as a smaller one-storey structure with a Mogul-style domed roof. After three years of planning to restore the temple to its original style, construction had just started when the April 2015 earthquake struck. Work has now resumed. Kathmandu's clocktower, the Ghantaghar, was modelled after London’s Big Ben by the Ranas and was reconstructed in its present form after the earthquake in 1934. 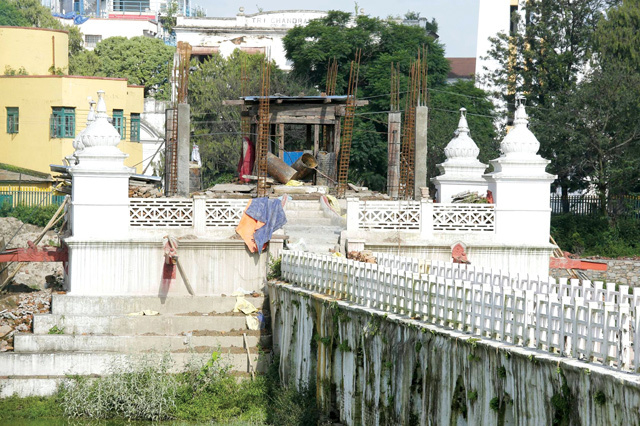 This issue has come to the fore once again, with the rebuilding of Rani Pokhari. A rare image of Rani Pokhari that shows the temple in the middle of the pond in Shikhara style, was found by heritage conservationist Dipesh Risal in the archival German publication, The Journey of His Royal Highness Prince Waldemar of Prussia to India: In the Years 1844 to 1846. Conservation architect Sudarshan Raj Tiwari says that while Shikhara style was popular during the time of Pratap Malla, the German image is just a sketch by an artist and not photographic evidence. Why leap the digital divide? At Davos this week, everyone spoke of the digital divide. What about the school divide, the hospital divide, the housing divide, the wealth divide? There are stark choices before Nepal: social unity and self-help versus cynicism about bad government and a culture of entitlement. The root causes of a languishing tourism industry are lousy marketing, a virtually defunct tourism board and, yes, over-supply. "I am not the Indian Ambassador"